Make 2019 the year you learn a new programming language. To help you expand your coding knowledge, we're excited to launch a free beginner's guide to learning Python. The self-study online Programming Essentials With Python course is now open for enrollment! Thinking of dipping your toe into Python? Below are some of the key factors that make our beginner’s guide to Python stand out. Programming Essentials With Python is a self-paced beginner's guide that takes approximately 10 to 12 hours to complete. The beauty of this online course is that you can chip away at each module when you find the time in your schedule. Your access never expires, so you can revisit the material in the future to brush up on certain concepts. Like the rest of our online introductory resources, Programming Essentials With Python is totally free, no strings attached. We believe in providing accessible avenues for coding literacy, and we hope this course inspires you to pursue coding at a more advanced level if you so choose. Python is consistently ranked as one of the most popular programming languages in the world, and it’s the reigning recipient of the TIOBE Programming Community Index programming language of the year. In 2018, Python ranked third, behind Java and C, among the most popular programming languages globally per TIOBE. You likely interact with Python every single day. Reddit, Google, Instagram, and Spotify are just a few of the top-visited websites globally built on Python. As Python continues to boom, there’s no better time to add the language to your skillset. 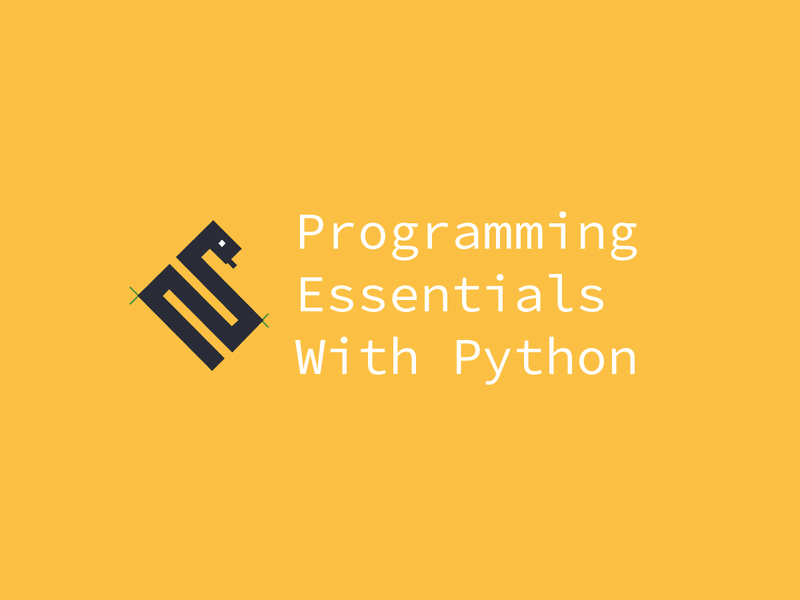 Whether you’ve never programmed before or have a basic level of coding knowledge already, Programming Essentials With Python provides you with a hands-on learning experience. The course walks you through the process of building a simple Python application, using fundamental programming concepts that are used in most applications. As concepts are presented, you’re introduced to examples followed by small challenges to ensure that they are able to utilize these concepts before moving on. Finally, each concept is then applied to the project, a word game, allowing for incremental but meaningful progress towards an end goal. Whether you've never programmed before, are familiar with other coding languages but not Python or you're someone who likes to work with data, our Python course is ideal for you. That's because Python is an all-round good language for any developer, from web to iOS, and can be used in a broad range of applications. Programming Essentials With Python was built 100 per cent by Lighthouse Labs alum and web bootcamp mentor Garrett Brick. Garrett is a polyglot software developer who thinks it's neat to help people learn new things. All you need to get started is access to a computer, a free account with Thinkific and a free account with online coding platform Repl.it which itself is a great tool to get used to programming on as it’s compatible with many other languages. Links are provided within the course itself too. Are you ready to get your code on? Enroll now.